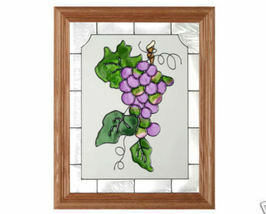 "Stained Art Glass Grapes Window Panel" This grape cluster, in rich purple hues, glows richly in this hand-painted stained art glass panel. Measures 13.5" wide x 16.5" high. 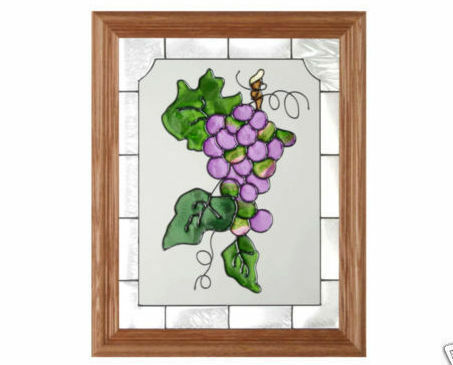 Wood framed in Medium Oak (Shown-Standard), Barn Board, or Whitewash. Please specify which frame when you order. It comes with two frame-top hooks for hanging. PLEASE NOTE: Shipping ONLY within the continental U.S. Hawaii, Alaska, and Puerto Rico residents please contact seller for shipping quote before ordering.